Lambert Houses. Image Credit: Google Maps. Three City Council members scolded HPD for the agency’s failure to plan for the stress new affordable housing developments place on the City’s infrastructure—notably schools. On October 19, 2016, the City Council Subcommittee on Zoning and Franchises heard testimony over the proposed redevelopment of the Lambert Houses—a mixed-use, affordable housing development in the West Farms neighborhood of the Bronx. A joint application submitted by the City and Phipps Houses would facilitate the redevelopment. The Department of Housing Preservation and Development submitted an application for an Urban Development Action Area designation, project approval and the disposition of the City property. The owner of the property, an affiliate of Phipps Houses, submitted an application for a zoning map amendment, two special permits, a zoning text amendment, a Mandatory Inclusionary Housing Area designation, and a city map amendment. Currently Lambert Houses consists of 14 residential buildings—containing 728 Section 8 units—and a commercial complex set on top of approximately 14 acres of land. Constructed in the early 1970s, the site is composed of six megastructures on superblocks with 14 addresses and 42 means of entry and egress. 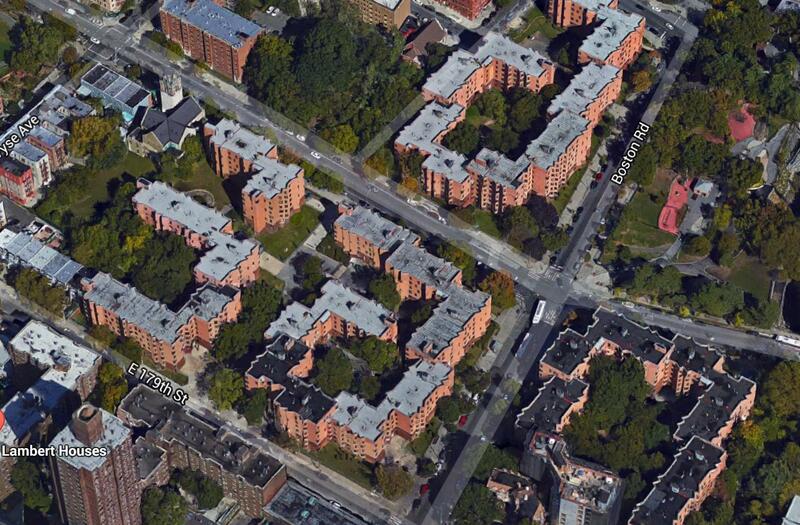 The development was built as part of the 1969 Bronx Park South Urban Renewal Plan which has since expired. The development is part of a Large Scale Residential Development area which includes the New York Housing Authority’s 1010 East 178th Street development, the New York Association of Catholic Homes’ and Fordham Bedford Housing Corporation’s West Farms Square development. The City property to be disposed of is a large sidewalk corner at Boston Road and Tremont Avenue. The corner was part of the 1969 Renewal Plan and slated to be cut off for a right turn lane for traffic traveling west on Tremont Avenue, however, it was never constructed. The redeveloped Lambert Houses would consist of 13 buildings containing approximately 1,665 residential units. The project would also construct 61,000 square feet of retail space, 110 accessory parking spaces on the roof of the retail space, and possibly a new public school. If built, the School Construction Authority will have the option to acquire land for a nominal consideration to build a new elementary school with approximately 500 seats. If SCA does not purchase the land, Phipps Houses would have the option to construct a five-story residential building containing 55 more housing units. Bronx Community Board 6 voted 14-7 to approve the application. Bronx Borough President Ruben Diaz, Jr. also recommended approval. The City Planning Commission found the proposed redevelopment to be appropriate and issued its report on September 21, 2016. Following the presentation, Chair Donovan Richards questioned how Phipps intended to address the relocation of the current residents of Lambert Houses. Adam Weinstein responded that Lambert Houses is not near full capacity and that since the redevelopment would be done in phases, after the construction of the first new building almost all of the current residents would be moved into that building. Adam Weinstein added that the key to relocation is customer service—from information to care. There will be a website with up to date information on relocation and a person whose sole job will be handling any issues which would arise with relocation. Those that refuse to relocate to the new Lambert Houses will receive a housing choice voucher from the U.S. Department of Housing and Urban Development. Council Member Ritchie Torres, representative for the West Farms neighborhood, asked how the existing Lambert Houses is difficult to secure. Adam Weinstein explained that Lambert Houses was a reaction to the typical urban renewal plans of the 1970s which were towers and a park. It was conceived as medium density, low rise housing. Each building interconnects at fire stairs, and each building has its own entrances and egresses, therefore once entered a person has access to every floor of every building. Combined with courtyards that cannot be secured because of the fire code and top floor hallways which only have egress doors for fire safety, the existing housing development is impossible to secure. Council Member Torres inquired how Phipps Houses intended to attract quality retailers to the new commercial spaces. Adam Weinstein answered that Phipps Houses employs a full-time real estate agent that will focus on quality credit tenants. He highlighted that the space along Boston Road would likely be for community retail and in line with the Bronx Zoo traffic which is nearby—such as a small shop, ice cream, food, etc. Adam Weinstein added that he did not want a “hang out bodega,” that was not what he was looking for. The sourcing of good users would be key. Council Member Torres followed up, asking if Phipps Houses could assure him there will be no 99 cent store or Kennedy’s Fried Chicken to which Adam Weinstein responded yes. On November 21, 2016, the City Council’s Subcommittee on Zoning and Franchises voted 4-0 to approve the Lambert Houses application with modification. The approved application now includes the Mandatory Inclusionary Housing option with deep affordability—half of the apartments will now be affordable for those making 30 percent or less of the average median income. Council Member Ritchie Torres, who represents the district, said he was “pleased with the outcome of the process.” He added that he had secured in writing from the de Blasio administration millions of dollars for investments in infrastructure in the area. The money would facilitate, among other infrastructure improvements, the construction of two new schools in the area—adding at least 500 new school seats to the school district. CC: Lambert Houses (LU 0482-2016; 0483-2016; 0484-2016; 0485-2016; 0486-2016; 0487-2016; 0488-2016).